As you read these pages, you will come to the word Lwa quite a bit. This is because they are the essence of Vodou and they are the basis of everything we do. It recently occurred to me that you may not just know what a Lwa is. You may not know how God is viewed in Haitian Vodou. So let me make some explanations for you. God in Vodou is most often seen as distant and not readily accessible to humans. Yes, Vodou is a monotheistic tradition. Oftentimes, God is considered not accessible because simply "he is too busy." Meaning that God has the whole universe to take care of, he has many things to do. This is understandable. We see God in the same way Roman Catholics do. He is a good, kind, loving God. Most Vodouisants are also Catholic. We attend mass and church services. One thing about God is certainly true, we listen about God (When we go to mass), we hear about God, but we do not see God. We worship God. Due to all of this, God has invested power in the spirits we know as Lwa. The Lwa, unlike God, are readily accessible to us. A Lwa is, at it's most basic definition, a spiritual entity. Lwa can be contacted through possession. Now, this is not considered demonic. Possession is essentially what all Vodou ceremonies are directed to achieve. This is what we want. We seek possession. In fact, the Kanzo (Vodou initiation) is aimed to invoke possession and improve the ability of it's candidates to become possessed. We, Vodouisants, do not worship the Lwa. The Lwa are served. We serve the Lwa by giving them their favorite foods, wearing their colors, observing their sacred days (by abstinence), through Vodou ceremonies, etc. The Lwa in turn serve us. They confer upon us material blessings, physical well being, protection, abundance, etc. See this is a double sided matter. Without us the Lwa would not exist, and without them we would cease existence too. Now, that you have that basic understanding, lets get a little more complicated, shall we? The Lwa are organized into groups. This makes it easier for us to serve them, as well as define certain characteristics of those Lwa. These Lwa may have a number of different things in common. 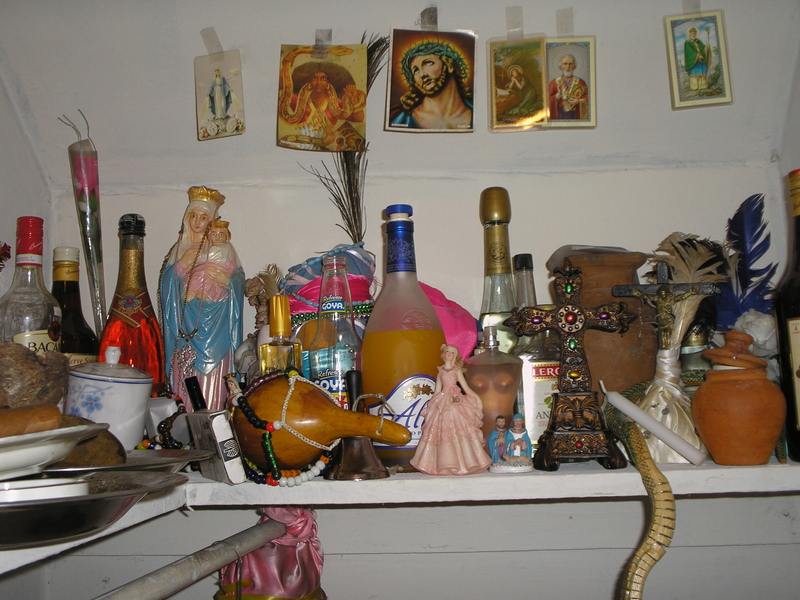 Vodou liturgy is divided into three seperate groups. The first of these is Rada. The majority of the Rada Lwa come from Dahomey. Dahomey is now known as Benin. Some lwa that come from Dahomey are Danbala Wedo, Ayida Wedo, Sobo, etc. They are spirits that traveled from Africa over to Haiti. The Rada lwa are considered to be cool, stable, and beneficient. They are associated with the color white. Their stance is more defensive than aggressive. Then you have the Petro Lwa. Petro Lwa are associated with the color red. They are considered more aggressive, fierce in fact, faster to act to against enemies, and particularly effective in the quickness of their magick. The real differentiation of the Lwa Rada and Petro is their origin. Petro Lwa tend to be Kongo, Kreyol spirits, or in fact from a number of different African tribes. Within the Petro rite, we have many other nasyon. Examples of these are the Ibo, Wangol, and Kongo. The origins of the Petro Lwa are also more obscure. Right in there with the Petro lwa, you have the Lwa Marinette. The Lwa Marinette was once a living person. She conducted the ceremony at Bwa Kayman to Ezili Danto, sacrificing a black female pig, thus marking the beginning of the Haitian Revolution. You also have the Gede lwa. They are seen as a family, with Baron and Brijit. The Lwas Baron and Brijit rebirth spirits of deceased who become Gede Lwa. So they are countless. There are so many Gede lwa, because they are constantly being rebirthed. There are also some Gede lwa that are "rasin" or root aspects. One of these is Brav Gede Nibo, often seen as the first ancestor. Those are the liturgical groups of the Lwa. Now, you need to understand that that is when they are served, in the liturgy. Many are from different nations. They have their own beats, protocols, etc.